Blue living rooms come in all shapes and sizes. From traditional to modern, to everything in between, blue is a color that spans across styles like no other. In fact, next to neutrals, there's no ​grasscloth-covered color to decorate with than blue. So whether your tastes turn to bright and bold, or soft and subtle, these blue living room ideas are sure to provide ample inspiration. Celebrity designer Thom Filicia is known for creating spaces that are classic yet have some sort of unexpected flair that set them apart from the crowd. This blue living room in Greenwich, Connecticut is no exception. One of the most important things to note is that while the paint is a very dark blue, it has a glossy finish which makes it more exciting and vibrant than a matte finish would. Consider this technique when using dark paint colors. A classic sitting room, like this one designed by Echelon Custom Homes, is the ideal setting for traditional and restrained Wedgwood blue walls. When paired with the white beadboard ceiling and light hickory floors the color reads almost like a neutral, yet it still lends enough depth to keep the room feeling robust. The color combined with the room's architectural details prove that a space​ can have a ton of personality before a single piece of furniture is placed within. There's no better color combination than blue and orange. In the case of this warm and cozy blue living room, designer Cory Connor used a dark but vibrant shade as the primary color and then accented it with hints of rusty orange. By painting the built-in bookcases the same color as the grasscloth-covered walls, she has created a feeling of intimacy, and there's a sense of being enveloped by this warm and welcoming color. Contrast is key in this transitional living room by Alice Burnham Interior Design. 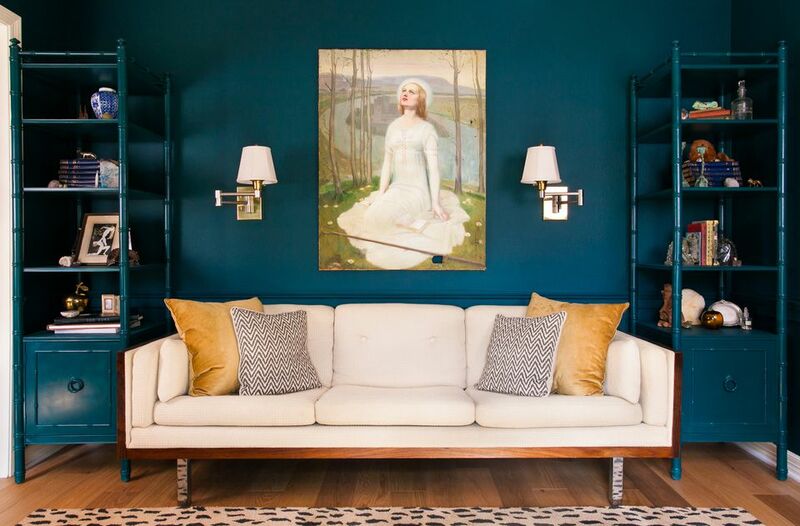 Dark blue grasscloth wallpaper provides the perfect backdrop for two pieces of modern art, while a blue mid-century modern sofa pops against crisp white wainscoting. Despite the use of several dark blues, the room maintains a light, airy feeling thanks to the considered use of white and cream. The calming colors of the sea and sky are perfect for Bohemian style rooms. In this living area, almost every single color is a shade of blue, with no real accent colors to speak of. This tone-on-tone look can be tough to pull off, but in this case, the huge window and massive amount of natural light coming through provide a break from the single span of color. Designer Sabrina Alfin created a breezy, beach-style retreat by marrying watery blues with sandy neutrals in this San Fransisco Bay area home. Slipcovered furniture helps lend the space a relaxed and casual vibe, while natural embellishments such as a jute rug, wicker baskets, and driftwood accents help bring the beach theme home. Delicate blues are great for adding soft elegance to classic spaces. Here designer Christina Marie used a soft blue tufted sofa in a very similar shade as the walls to create a comfortable and calming space. Texas-based designer ​​Erin Williamson created drama in this space with a deep, almost electric shade of blue. With the bamboo-style etageres being painted the same color as the walls, they almost appear to be built in and give the room a sense of great architectural depth. The cream sofa practically jumps out from the wall, creating a dynamic focal point. A soothing palette of soft blue, grey and white makes for a calming atmosphere in this traditionally-styled living room. Here the team from Digs Design Company used a soft shade of blue on the walls and then layered in items of the same tonal quality to create the look. Fans of crisp and sophisticated transitional style can get exactly what they want using darker shades of blue. In this large blue living room the design team of Accents Et Details used Stiffkey Blue by Farrow and Ball on the walls which add richness and character and beautifully enhances the architectural details. When combined with the neutral colors of the furniture and the rich wood floors the result is both striking and sophisticated. Decorator showhouses are designed to showcase the design talents of interior design professionals, and in many cases it gives them a chance to flex their muscles and have a little fun. In this room from the 2012 Kips Bay Decorator Showhouse designer Brian del Toro used the eye-catching combination of dark teal and lime to create a striking effect. Unlike navy or indigo, teal has a warmth that adds coziness to dark rooms. Eclectic is something of an all-encompassing design term, and blue is an all-encompassing color, so the two go together in home decor beautifully! In this room designed by Dineen Architecture and Design, the dark blue walls provide a stunning backdrop for a collection of both modern and traditional items. According to designer Annie Lowengart, the inspiration for this blue living room came from an antique tapestry done in rich blues and warm ambers. Drawing on that foundation an elegant yet funky living room was born. The feature wall and built in bookcases are painted in Farrow & Ball's Chinese Blue which adds warmth and a bit of playfulness to this wonderfully eclectic living room. Deep indigo is a rich and robust color and depending on how it's used it can be dark and moody, or bold and uplifting. In this room designed by Linda Burnside Interiors it's a bit of both. The color on the walls is quite dark and rich, but the pops used on the light-colored furniture and drapery fabrics add a sense of playfulness. Light colors are ideal for open, airy spaces like this open concept living room and kitchen designed by Schell Brothers Home Builders. Reminiscent of the sea, the wall color is ideal for rooms trying to acheive a coastal vibe. The addition of sand colored upholstery, a stone hearth, and beadboard ceiling complete the coastal look without being kitschy. Blue has been used in interiors for centuries, which is perhaps why so many blue rooms tend to have a timeless quality to them. At least this transitional blue living room by designer Kate FitzGerald-Wilks certainly does. Classic elements like the tufted sofa and nailhead trim definitely play a part, but the particular shade of blue used has a timeless quality that will never go out of style. Paint isn't the only way to infuse walls with a hit of blue. In this New Traditional room, a blue grasscloth wall covering was used to wrap the room in color. Dramatic table lamps and hits of orange enhance the color and make for a dynamic space. When exploring blue living room ideas, colors that combine blue with something else are definitely worth considering. Periwinkle is a combination of blue and violet that can add some fresh and lively flair to all sorts of rooms. While not commonly seen in midcentury modern rooms, this particular shade adds a sense of fun and originality to the space featured here. Beach style is often thought of as casual, but this blue living room by Alexandra Rae Design is all about bringing beach style to the next level of sophistication. Tailored furniture, softly patterned wallpaper, custom drapes, and a coffered ceiling add a sense of formality, but the wicker chairs and multiple shades of soft aqua help to maintain that easygoing coastal atmosphere. Robin's egg blue is the perfect wall color for this highrise condo in the sky. With a ​grasscloth-covered span of windows a ton of natural light comes through, enhancing the open concept space and making the most of the blue and white color scheme. 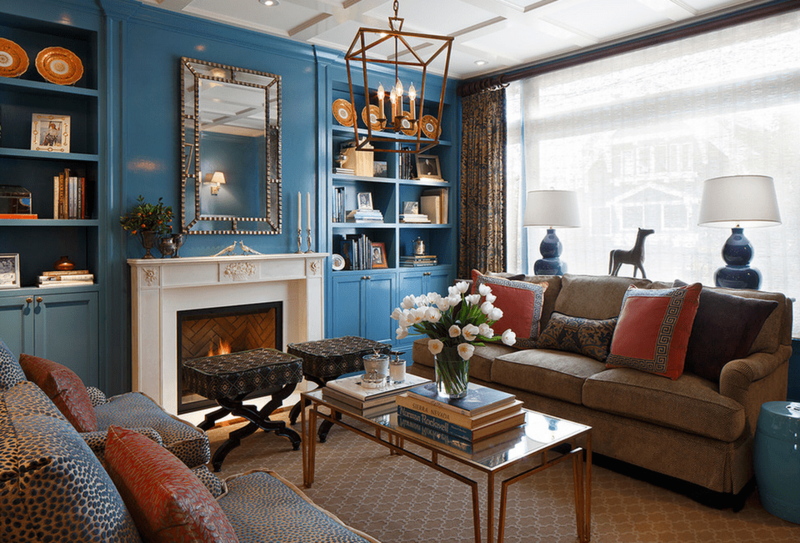 The wall color is only one of the blue elements in this traditional living room. The furniture, rug, artwork, and accessories all use various shades of both light and darker blue to tell their stories. In order to create a similar look make sure there's a complimentary accent color used liberally throughout, and consider symmetry when placing furniture and accessories. Living Room Curtains - Your Windows Deserve the Best!